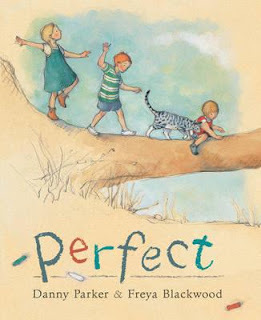 This picture book is one of those gems that are just right for sharing with pre-schoolers who love to see the details of their daily lives on the pages of a book. It is amazingly simple, with brief lyrical text from Danny Parker. Writing text like this for a books is, I think, one of the hardest things to do, to keep it simple but still somehow magical. It's been illustrated by one of my all-time favourite illustrators, Freya Blackwood. 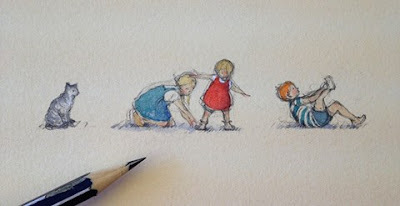 It's definitely worth having a read of her post about illustrating this book. I'm constantly captivated by Freya's ability to capture the child's body with her pencil and paint, the perfect curve of a calf, the tilt of a head, the sticky-out hair. 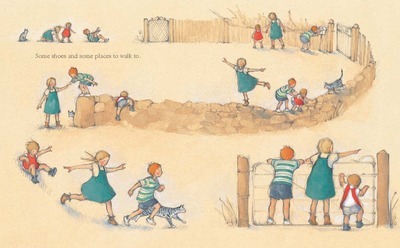 It reminds me of that other great picture book artist, Shirley Hughes. 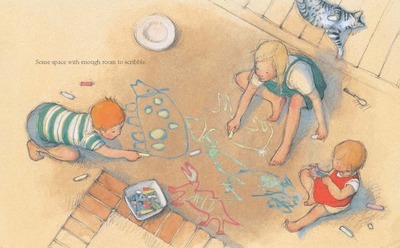 The ordinary child and an everyday environment - an Australian scene with the sandy clay colourings, depicted in such a way that you feel you are there, and could scoop up one of the warm and lovely children for a cuddle. But there are no adults seen here, as the children move on out to wider countryside, flying hand-made kites, then home for food then finally the younger two giving in to sleep, arms flung to the side, while the eldest child reads a book. Perfect. I borrowed this book from the library, but if you go and buy a copy, there is a free Perfect print inside the book. Treasure indeed.